Being a parent is truly a blessing, but it comes with a great deal of responsibility as well. When Allah blesses you with that little bundle of joy, you as a parent have so much hope for them. You plan their whole life before they are even born. You pick their schools, their careers, and you are even able to imagine how your grandkids will be running around you while visiting with you. It is beautiful to imagine as they grow older, get wiser and become more responsible. This dream can be shattered when one has a special needs child. Regardless of the disability, or I would rather say “different ability”, the task is challenging. Not just because the parent needs to pay more attention to the child, help them more physically and emotionally, but now they also have to protect them from society. They have to think about the future of their child when they are no longer there to be able to help and support them. I am the mother of a special need child who has Autism, and I will not sugarcoat it for you. I have many challenging days, but I also have many rewards on a daily basis. My son at times requires 24/7 supervision, and he needs help with everyday tasks. He needs a different approach to educate him, and he needs my protection from people who had hurt him physically and emotionally before, and people who are not knowledgeable of his condition and therefore judge him and our family. Sometimes these children have different disabilities and various kinds of conditions from birth, and the parents take care of them accordingly from day one. Others though are born healthy, typical children, and for one reason or another, the child becomes a special need child later. Neither of the scenarios is worse than another. As always we encounter a feeling of loss; a loss of our imagination and dreams for their future. We experience the process of grieving, but we must go on and never give up. The parent or close caretaker is the only advocate for these children, and if we do not stand up for these kids’ rights, no one will. Our special needs children need our special attention and our unconditional love, regardless of their mental or physical status, so do not take it away from them because they are not what you imagined or hoped for. Caring for any child is hard work. It is a big responsibility shaping the future generation. This is the task that we have to take very seriously. Caring for a special needs child will take more effort, more energy and it will require working together with our family and community. Families with special needs children need to reach out and take advantage of resources, and they must educate themselves about their child’s condition so they can make informed decisions regarding their care, their education, and their future. Educating ourselves about their disability will enable us to help our kids to have a better life, understand what they might feel, experience, what their fears or struggles may be. This knowledge will consequently make our work as a caretaker much easier, and we will be able to connect with our special needs children better. 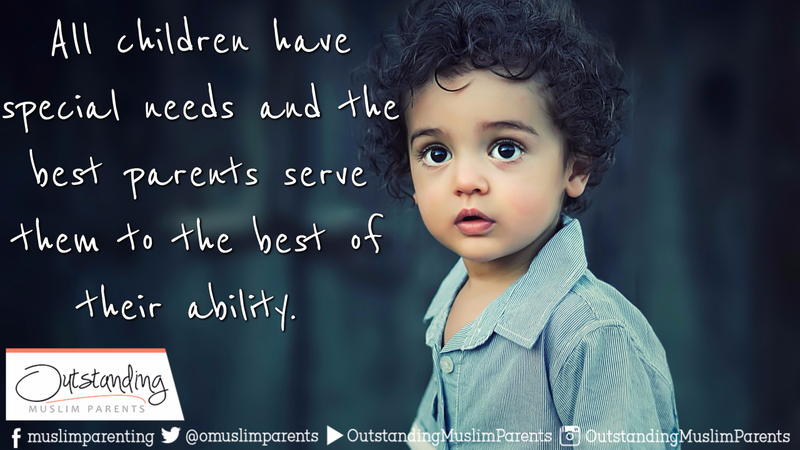 Parenting children with different abilities is hard work, so no one parent should take all the responsibility caring for them alone. The entire family – including siblings and grandparents - needs to share equally, and allow each member of the team adequate rest and time to unwind and refresh their focus. They must reach out to support groups where they can get more information about medical treatments, therapies that may benefit their kids and resources for help like respite care in some cases. Also, these groups often offer counseling as well. Furthermore, nurturing and taking care of the marriage is very important. A broken family would hurt a special needs child even further. All family members should pitch in to help give the parents some time to spend alone even if it is only a few hours for a special dinner from time to time. Moreover, a typical healthy sibling needs a lot of support as well in the family of a special needs child. I often refer to these kids as “silent victims”, needing a lots of reassurance. Parents need to make sure that each have some alone time with the typical sibling, to discuss issues, watch a movie or just play a game with them so they know they are important too and so they don’t resent their sibling. Having to take care of a special need child is not the end of our dreams, and it is not a nightmare as many may think. We must look at the good in everything we experience. Indeed, Allah has said in the Quran that His Mercy encompasses everything and it is from our belief as Muslims that everything that He does is best for us. I have personally become a more observant mother than I was before, and I developed an enormous amount of patience. My worship increased, my du’aa developed a depth I never thought possible and my reliance upon my Lord has grown to a level very dear to me. I have also met amazing people along my journey. The road of parenting is always bumpy; regardless if you are raising a typical child or a special needs child, or even both as we are. Raising a child, any child, is a huge responsibility, but at the same time it is a great blessing in disguise.